That’s what children at Kallista’s “bush kinder” are learning each week. 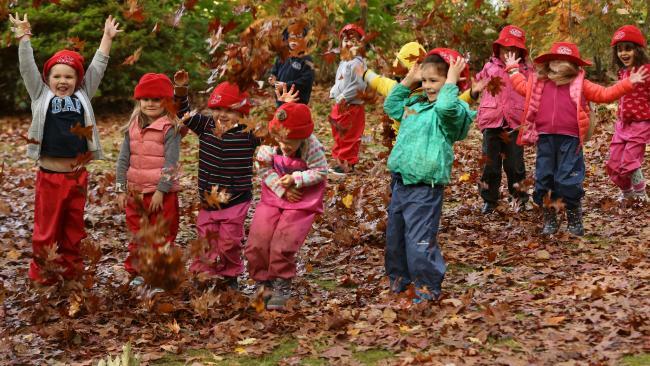 As part of Kallista Kindergarten’s Nature Kinder program, kids spend one day a week frolicking in the George Tindale Memorial Gardens in Sherbrooke, where sticks, stones, leaves and wild imaginations form their toy chest. Kinder teacher Rose Major said since the program began three years ago, parents have flocked from across the outer east to give their kids the chance to get up close and personal with nature. 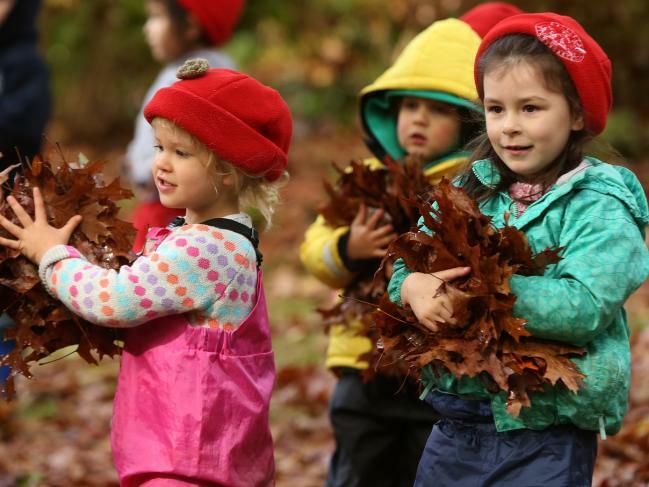 A Nature Playgroup for younger children was set up last year due to popular demand. 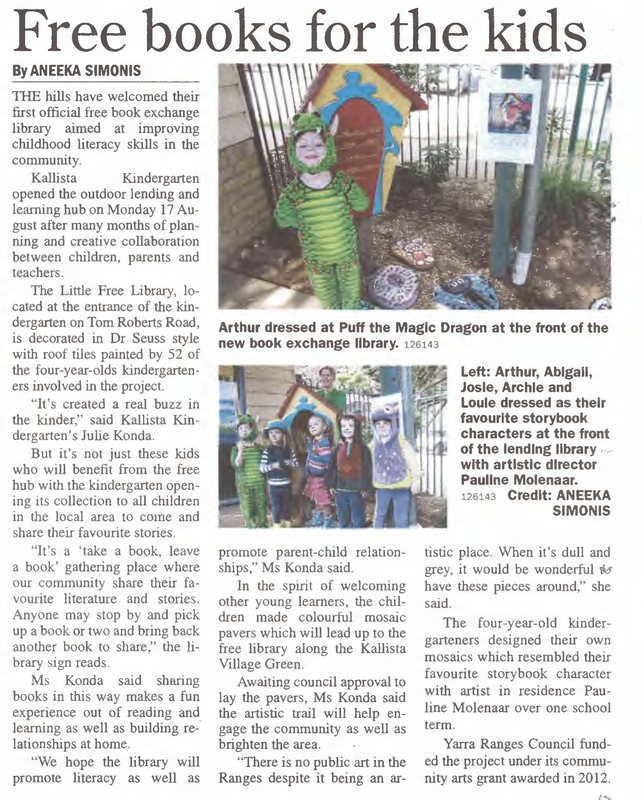 “The kinder is now drawing enrolments from as far afield as Ferntree Gully, Boronia and even Wantirna South,” Ms Major said. Upper Ferntree Gully mum Angela Tettamanti chose to send her son Oliver, 4, to Kallista Kindergarten because of the program. “I love that he is learning respect for creatures and plants, and that he is developing an understanding of seasons, not from books or looking out a window, but from actually being in nature,” she said. Ms Major said there was research to suggest there were many benefits for children’s health and development from regular outdoor play sessions. 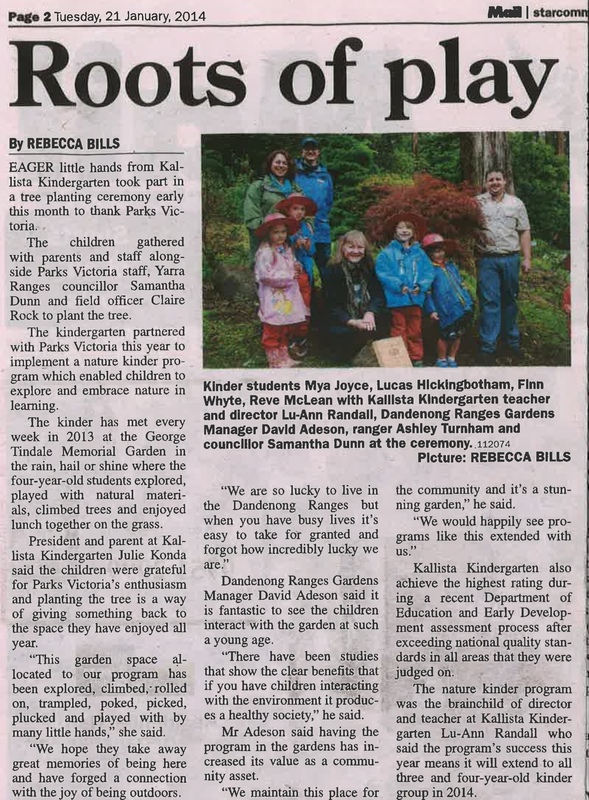 The kinder has also linked with other local community groups, including the EPIC Project which launched a permaculture and children’s garden in the George Tindale Gardens last week. For more information, phone the kinder on 9755 2647. Senator Scott Ryan and Casey MP Tony Smith at the Kallista kindergarten. PRESCHOOLERS at the Kallista Kindergarten are now learning Japanese as part of the Australian Government’s $9.8 million Early Learning Languages Australia (ELLA) trial. Scott Ryan, Parliamentary Secretary to the Minister for Education and Training, and Casey MP Tony Smith visited the Kallista Kindergarten last week. The kindergarten is one of 41 pre-schools across Australia taking part in the trial to explore new ways to help children learn languages other than English. The ELLA trial will comprise seven applications (otherwise known as apps) to teach pre-schoolers basic Mandarin, Japanese, Indonesian, French or Arabic language skills. Senator Ryan said the ELLA trial is designed to give pre-schoolers the opportunity to recognise different sounds and language concepts. “Children are growing up in an increasingly competitive and globalised world,” Senator Ryan said. Mr Smith said he was delighted local children were selected to take part in the trial. “It’s great to see our election commitment fulfilled and that Casey children are benefitting from this language trial,” Mr Smith said. Seven language-specific apps, in five different languages, will be progressively rolled out to the trial pre-schools throughout this year. These exciting new apps will give children the opportunity to develop recognition of the different sounds and concepts of a language other than English through play-based learning. Forty preschools across Australia have been selected from more than 1000 applicants to take part in the Abbott Government’s trial of a second language in the year before school in 2015. Assistant Minister for Education Sussan Ley today unveiled the full list of successful preschools for the $9.8 million Early Learning Languages Australia (ELLA) trial, which will use play‑based apps to help generate interest in language studies that can be built on in later schooling. Ms Ley said the strong response to the trial – 1118 preschools in total – ensured a diverse representation of preschools involving every state and territory. “Our children are now techsperts from early on, particularly with the vast array of interactive early education applications and games that are now available at their fingertips,” Ms Ley said. “This play-based approach is therefore a fun and easy way to get our kids interested in learning skills for life, such as a language other than English, from early on in their education journey. “These trials show the Australian public is clearly interested in the Government’s broader plans to promote participation in language studies from the early years through to year 12. “And it’s easy to see why, when the proportion of Year 12 students studying a language other than English has dropped from about 40 per cent in the 1960s to about 12 per cent today. Ms Ley said there would be a total of 12 trial sites in NSW, nine in Victoria, eight in Queensland, five in WA, three in SA, and one each in Tasmania, the NT and the ACT. This includes a mix of metropolitan, regional and remote trial sites across various preschool models, including government-run, standalone community-based and long day care, she said. Ms Ley said each preschool would trial one of five languages – Mandarin, Japanese, Indonesian, Arabic or French – with the final language allocation to be confirmed before trials start next year. “I would like to thank everyone who applied to participate in the trial. We’re essentially talking about one-in-seven preschools in Australia – a fantastic result,” Ms Ley said. Ms Ley said the ELLA software was currently in the development phase and the first series of apps would be ready to be rolled out in time for the trials beginning early next year.